In the latest desperate attempt to criticize President Obama in the wake of Osama bin Laden's death, right-wing media are hyping a U.K. Daily Mail article to attack Obama for taking 16 hours to consider his decision regarding the assault on bin Laden--which reportedly had several potentially harmful consequences--by calling Obama "feckless" and "our sleepy president." 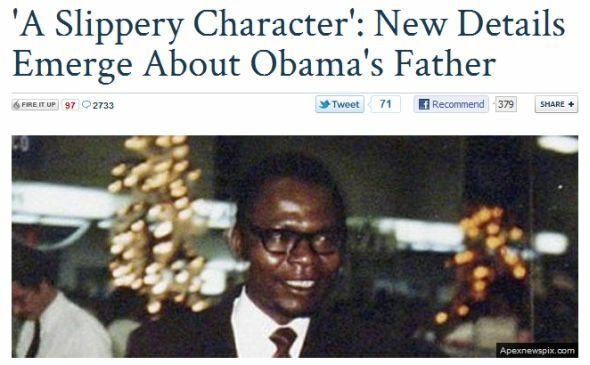 The third paragraph of the Daily Mail article stated: "Obama senior married Stanley Ann Dunham, a white student from Kansas, not only when he was said to have already been married to a woman in Kenya, but at a time when interracial marriages were still illegal in many parts of the U.S."
Fox Nation and the Daily Mail both used the headline " 'A Slippery Character': New Details Emerge About Obama's Father" for this piece. But while it is true that interracial marriages would not be legal throughout the United States until the 1967 Supreme Court case of Loving v. Virginia, one might well ask: Why is it evidence of Obama's father's "slippery character" that his marriage to Obama's mother took place at a time that half the states across America prohibited interracial marriage when Barack Obama Sr. married Ann Dunham? It is not. It would only be important to someone who considers interracial marriage to be problematic. Yet, the article still seemed worthy enough for the Fox Nation to republish it. We've said it before, and we will probably say it again, but you shouldn't blindly believe the stories that come out of the British press. Today's story in the Daily Mail -- promoted by factually challenged conservative blogs like Jim Hoft's Gateway Pundit, Weasel Zippers, and Glenn Beck's The Blaze -- claims that President Obama made some sort of insult towards the British when he said, "We don't have a stronger friend and stronger ally than Nicolas Sarkozy, and the French people." Barack Obama has declared that France is America's greatest ally, undermining Britain's Special Relationship with the U.S. The President risked offending British troops in Afghanistan by saying that French president Nicolas Sarkozy is a 'stronger friend' than David Cameron. The remarks, during a White House appearance with Mr Sarkozy, will reinforce the widely-held view in British diplomatic circles that Mr Obama has less interest in the Special Relationship than any other recent American leader. This is a ridiculous assertion to make. Nowhere in Obama's statement does he elevate the French above the British, or vice versa. He is using standard-issue diplomatic speech when addressing an ally during a White House visit. Former President George W. Bush made similarly diplomatic statements about Japan, praising that nation in 2007 by asserting three times in one speech that there was "no stronger ally" than Japan. Bush again hailed the alliance with Japan in 2008, claiming that there was "no stronger ally in defeating terror" than former Japanese Prime Minister Junichiro Koizumi. On May 11, 2010, President Obama said "the United States has no closer friend and ally than the United Kingdom, and I reiterated my deep and personal commitment to the special relationship between our two countries" while congratulating David Cameron on becoming the new British Prime Minister. On July 20, 2010, President Obama said, "the United States has no closer ally and no stronger partner than Great Britain. And I appreciate the opportunity to renew our relationship with my partner, Prime Minister Cameron." ''We have no better friend than Japan,'' Ms. Rice said at the State Department. It was a familiar refrain. As secretary of state, Ms. Rice has said that the United States had ''no better friend'' than Jordan, Greece, Italy, Australia, Singapore, Britain and, separately, the United Kingdom. Of course, diplomacy depends upon stylized language, and other administrations have been equally adept at recycling it. But ''no better friend'' seems to imply an intimacy at odds with too frequent use. Thomas E. Patterson, a political scientist at Harvard's Kennedy School of Government, notes that the term is semantically clever. ''You could at least argue that there could be more than one in a 'no-better-friend' category,'' he said. James P. Rubin, assistant secretary of state in the Clinton administration, said: ''In diplomacy, you want to give everyone the impression that they're at the top of the list and this is a way doing that, a way of leaving room for a lot of people. In 2002, President Bush told an audience in Alaska that "we've got no better friends than Canada." My most important job--and I suspect Jacques feels the same way--is to protect our citizens from further attack. And it's--we've got no stronger ally in that task. I mean, he is willing to take steps necessary, obviously within the laws and Constitution of this country, just like I'm within the Constitution of mine, to protect our people. And for that, I'm very grateful, Mr. President. The future of the Phillipines was of great importance to the United States. Our huge military stations there, Clark Air Force Base and the Subic Bay naval base, were among our largest in the world and the anchor of our defense in the western Pacific; and we had had no stronger ally anywhere than [Ferdinand] Marcos. Secretary Ridge reaffirmed President's Bush statement on Mexican President Vicente Fox's State Visit in September 2001 that "We have no greater friend than Mexico and our commitment never wavered." Secretary Ridge said of his meeting with Secretary Creel, "You can't choose your neighbors but you can choose your friends." In a February 2008 visit to Australia, Defense Secretary Robert Gates said, "As has been for many years, the United States has no better partner and no stronger ally than Australia." In 2008, CIA director Michael Hayden said America has "not had a better partner in the war on terrorism than the Pakistanis." Sen. John McCain (R-AZ), said in 2006 that "in the war against terror, we have no stronger ally than Israel." In March of 2010, now-Speaker John Boehner said that "We have no stronger ally anywhere in the world than Israel." Rep. Leonard Lance (R-NJ) said that "Israel is our closest ally." On the floor of the House, Rep. Mark Souder (R-IN) referred to Israel as America's "best ally." On March 23, 2010, Rep. Mike Pence (R-IN) said "The American people consider Israel our most cherished ally."